This is two reviews in one, which I don't usually do, but they're both made my the same person - that person being Kate Berwanger; writer, photographer, and all round creative mastermind. I found these on Etsy and thought they looked so beautiful that I had to buy them and, by chance, it turned out that I already followed Kate on Instagram. Each of these zines contains a short story by Kate, both tales of toxic relationships, both wonderfully written, both mesmerising and harrowing at the same time. The zines themselves are even more beautiful in the flesh than in the photographs. Delicate and precious and printed on a lovely paper stock. Buy them via Etsy. 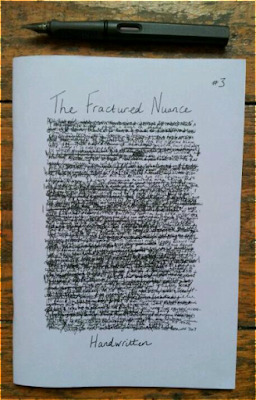 This third issue of lit zine The Fractured Nuance was released to coincide with National Handwriting Day (which was on Jan 23rd, if you didn't know). 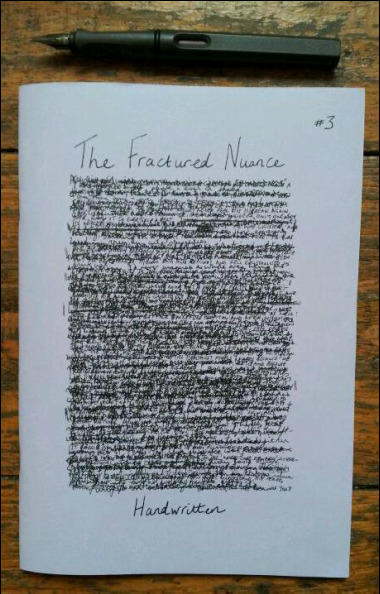 As you have probably guessed, each piece inside the issue is handwritten, each one by its individual contributor. I think this is a terrific idea and I wish I had thought of it for PAPER AND INK. The pieces inside the issue are varied, from contributors the world over; short stories, flash fiction, poems, illustrated pieces, long and short. The eclectic feel, along with all the different handwriting styles make the zine feel very intimate and personal. The only slight problem that I found was due to difficulty in reading some of the handwriting. Writers are not known for having the best handwriting, I think we're up there with Doctors in that sense. However it was rewarding to stick with it and decipher the difficult bits. Buy it right here. "Outside, life was hard. To earn money they undertook UNBORN PEOPLE TRAFFICKING IN BAGS OF FROZEN PEAS... 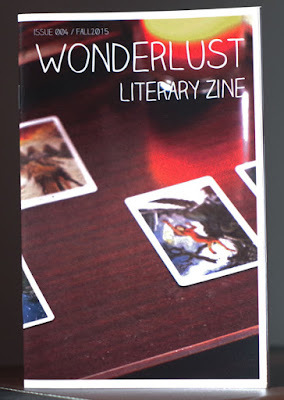 IN BAGS OF PETIT POIS IF YOU PAID MORE"
The first three issues of Wonderlust Literary Zine were great, and I even had a short story published in the third one, however this fourth issue is by far and away the best one yet. It would seem counter intuitive to say different, but it is true. I genuinely fell head over heels in love with the words inside this zine. A glorious mixture of emotions experienced as I turned each age. Highlights include The Dark by Shelby Traynor, Witch Night by Fanni Suto, poetry by PJ Carmichael and Tom Buron, The Same Picture by Jenn Johnson, Funeral of a Foe by Graham Old was a harrowing story and difficult to read but fantastic writing, Park Slope by Maria NG, We Are Not Snowflakes, We Are Barcodes by Jason Bates, The Historian by Jodie Matthews and Eulogy For A Dive Bar by Krystle Ratticus. 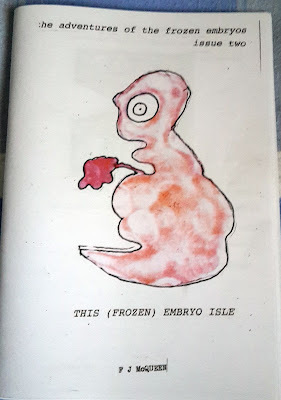 There are zines that I read and enjoy that I know I will probably never read again, but there are zines like this one that I will read again and again, and you should too. 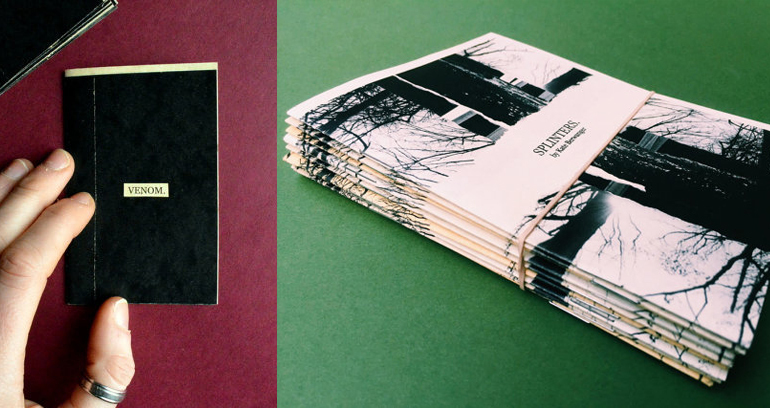 Buy one via Etsy or Nine Lives Zine Distro.